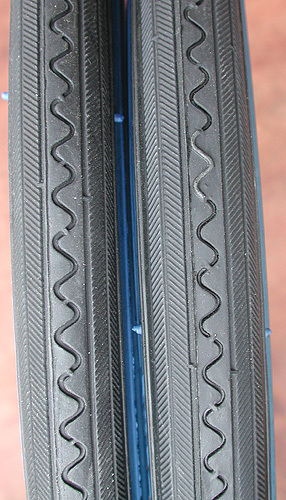 A Set New Bicycle Tires in the 700c Size. 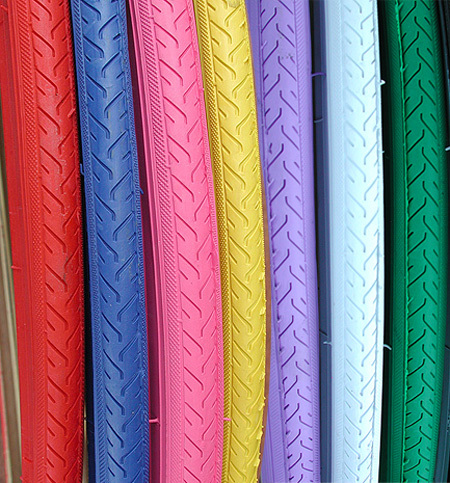 Tires come in Colors: Yellow, Pink, White, Green Red, Blue, Grey, Orange Stripes & Black. 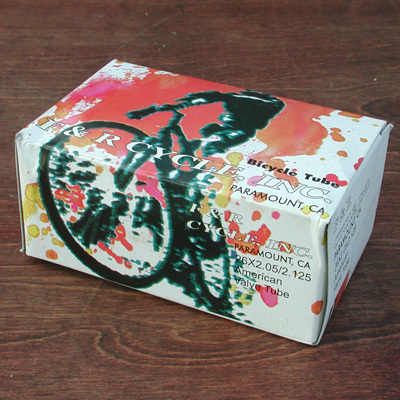 Fixed Gear, Single Speed, Fixie, Road, Track, Bike Rubber. 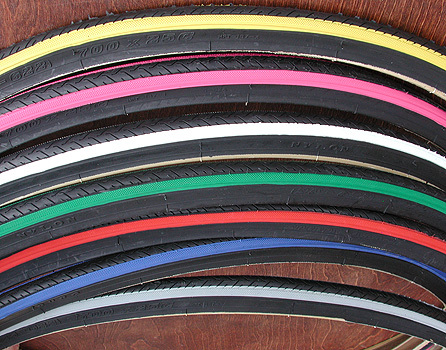 ( A Set ) 2 New Quality Import Rubber 700 x 25c road bike tires with wide Colored Stripes, Your Choice of Yellow, Pink, White, Green, Red, Blue, Orange, and Grey stripes and Black. Cool Street Pattern, Quality Performance, and Look. 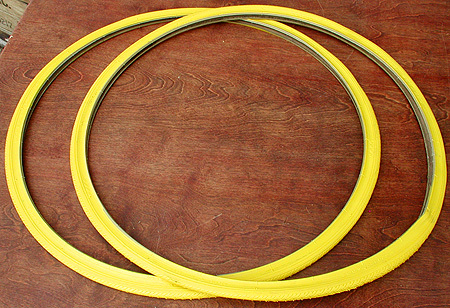 The 700 size is common to most Newer Road Bikes and Fixed Gear wheelsets. 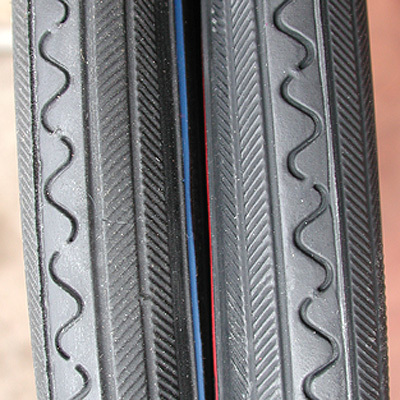 Please Check your existing tires to confirm size. 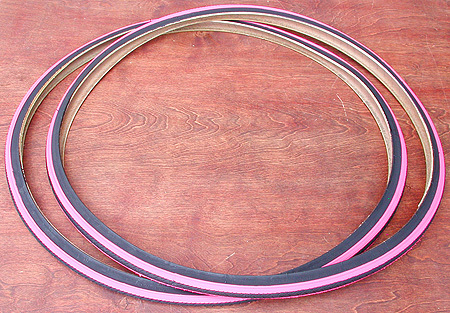 Cool Fashion Rubber tires, perfect for for Your Vintage Fixed Gear, Single Speed, Fixie, Road, Track, Bicycle. Colors are Sharp Brilliant but some color didn’t photo so well, Like yellow. 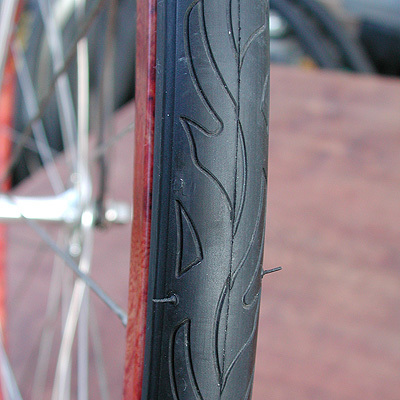 A Set New Bicycle Tires in the 700c Size with Inverted Flame tread. 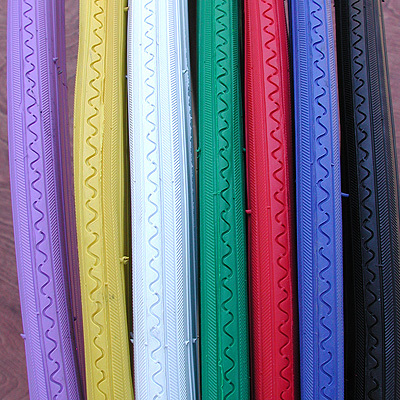 Cool Rubber for Your Fixed Gear, Single Speed, Fixie, Road, Track, Bike. 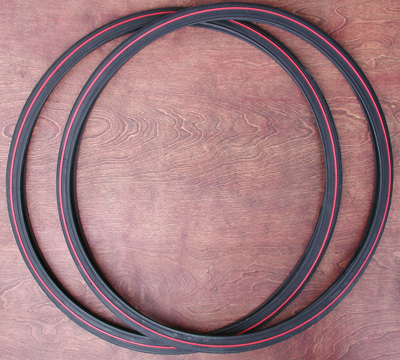 ( A Set ) 2 New Quality Rubber 700 x 23c road bike tires with a Inverted Flame tread, A Cool Street Pattern, Quality Performance, and Look. The Inverted Flame Channels water away from the center. 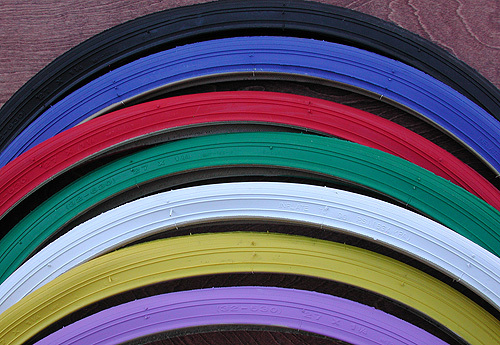 These tires are perfect for training, conditioning or general use. 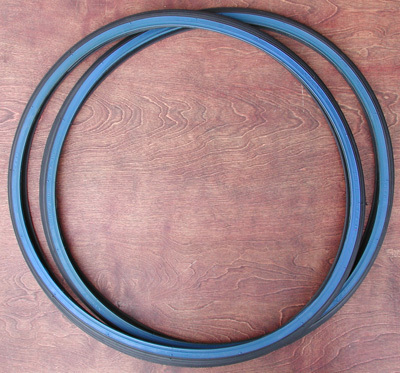 The 700 size is common to most Newer Road Bikes and Fixed Gear wheelsets. Please Check your existing tires to confirm size. 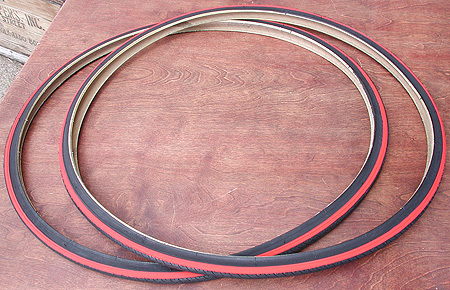 Cool Fashion Rubber tires, perfect for for Your Vintage Fixed Gear, Single Speed, Fixie, Road, Track, Bicycle. 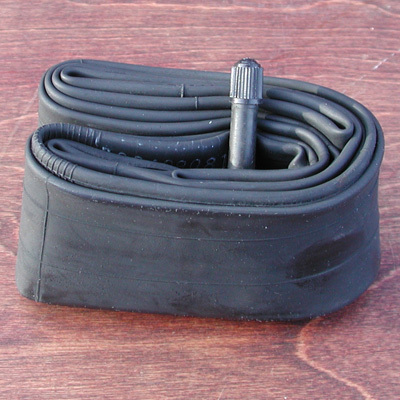 A Set New Bicycle Tires in the Vintage 27″ Size. 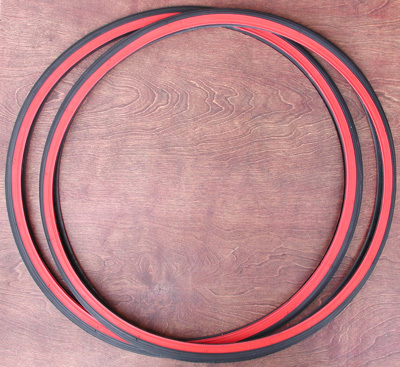 Tires come in Black with Blue, Red, or white sidewall. Also Come in Solid Colors Black, White, Red, Blue, Yellow, Green, Pink, and Purple. 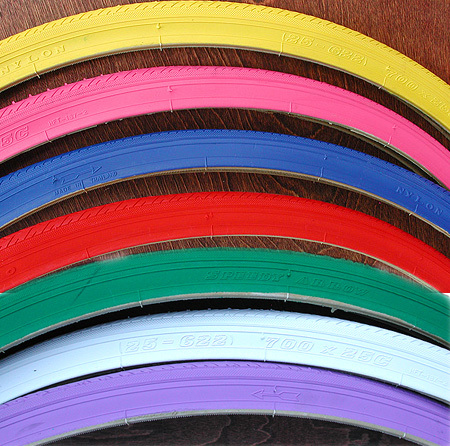 Cool Rubber for Your Fixed Gear, Single Speed, Fixie, Road, Track, Bike. 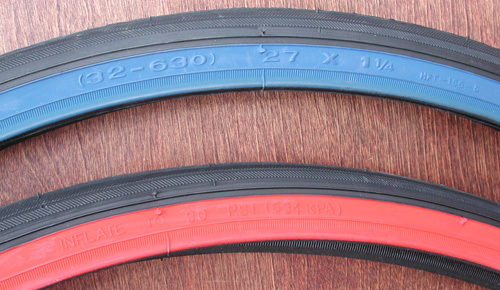 ( A Set ) 2 New Quality Import Rubber 27″x1 1/4″ road bike tires with Colored sidewalls, Your Choice Tires in Black with Blue, Red, or white sidewall or Solid Colors Black, White, Red, Blue, Yellow, Green, Pink, and Purple. 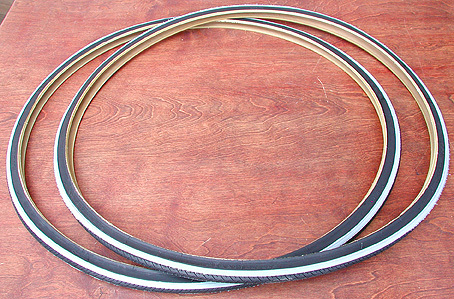 The 27″ size is common to most all Vintage Road Bikes, ( aka 10 Speeds but not limited to 10 speeds ). Please Check your existing tires to confirm size. 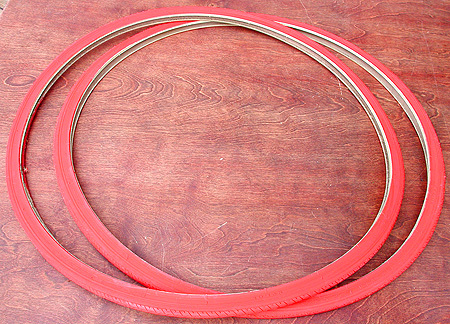 These tires also replace 27″x1 1/8″ and 27″x1″ tires. 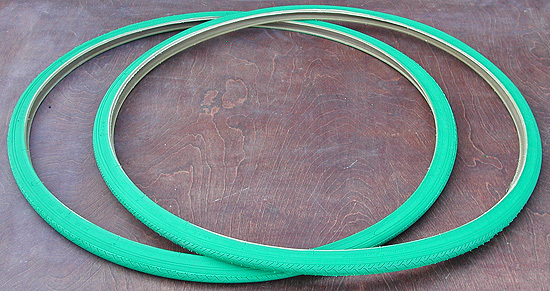 These tires are perfect for for Your Vintage Fixed Gear, Single Speed, Fixie, Road, Track, Bicycle. 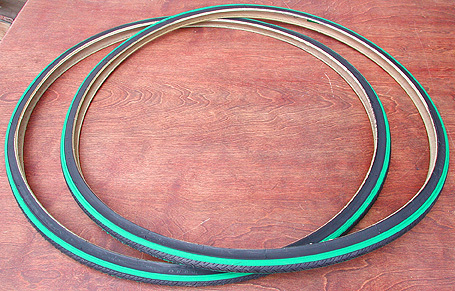 A Set New Bicycle Tires in the Vintage 27″ Size. 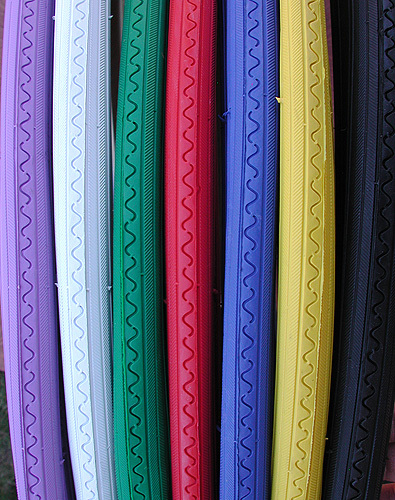 Tires come with Blue, Red, Green, or Yellow Stripe. 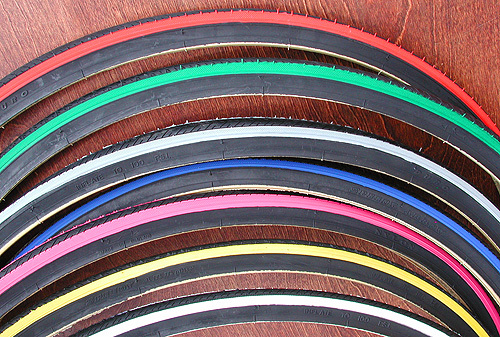 Cool Rubber for Your Fixed Gear, Single Speed, Fixie, Road, Track, Bike. 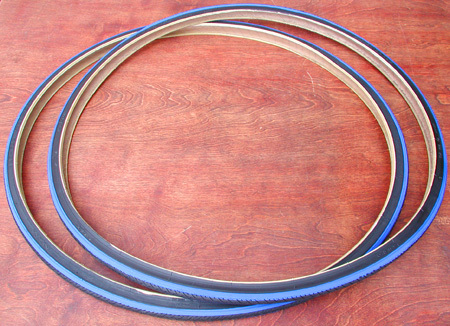 ( A Set ) 2 New Quality Import Rubber 27″x1 1/4″ road bike tires with Colored Line Stripe, Your Choice of Blue, Red, Green, or Yellow line stripe. 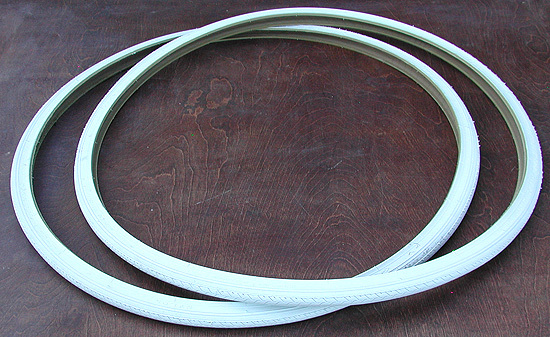 The 27″ size is common to most all Vintage Road Bikes ( aka 10 Speeds but not limited to 10 speeds ). Please Check your existing tires to confirm size. 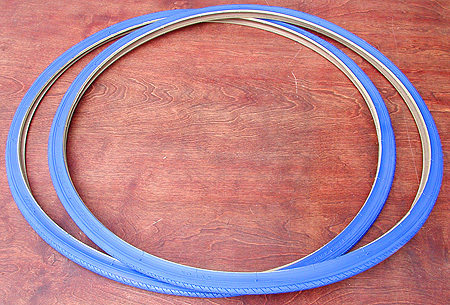 These tires also replace 27″x1 1/8″ and 27″x1″ tires. 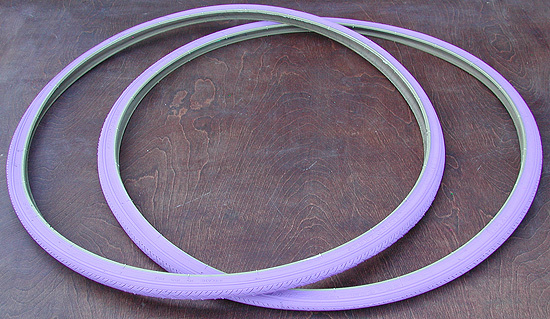 These tires are perfect for for Your Vintage Fixed Gear, Single Speed, Fixie, Road, Track, Bicycle. 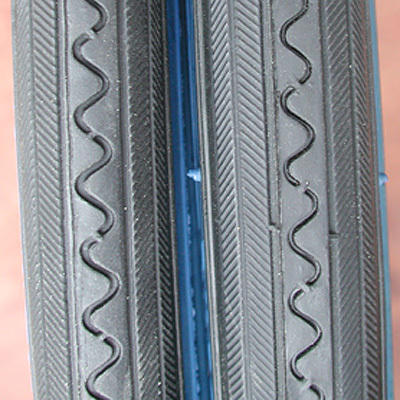 A Set Bicycle Tires in the 700c Size. 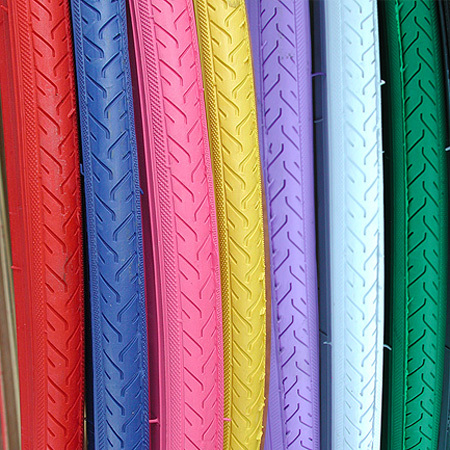 Tires come in Solid Colors: Red,Blue,Pink,Green,Orange, White, Purple, &Yellow. 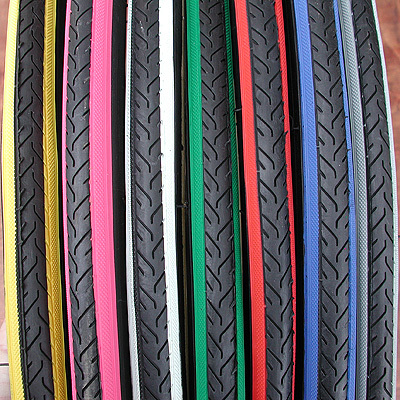 Cool Rubber for Your Fixed Gear, Single Speed, Fixie, Road, Track, Bike. 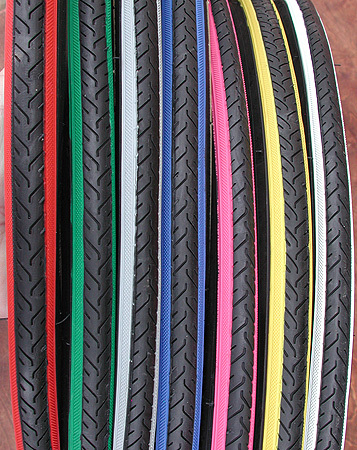 ( A Set ) 2 New Quality Import Rubber 700 x 25c road bike tires in Solid Colors, Your Choice of Red, Blue, Pink, Green, White, Orange, Purple, and Yellow. Cool Street Pattern, Quality Performance, and Look. 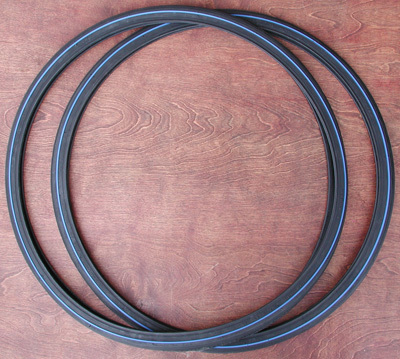 The 700 size is common to most Newer Road Bikes and Fixed Gear wheelsets. 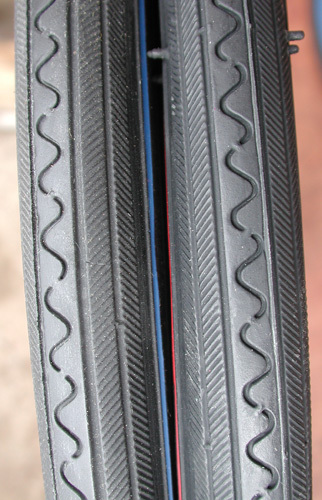 Please Check your existing tires to confirm size. 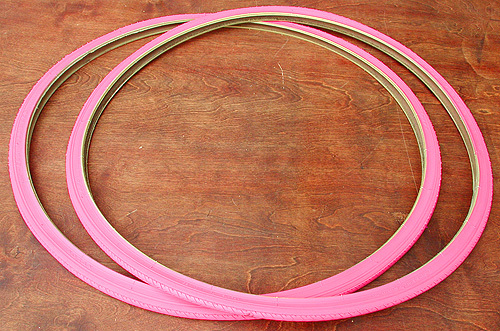 Cool Fashion Rubber tires, perfect for for Your Vintage Fixed Gear, Single Speed, Fixie, Road, Track, Bicycle.